White waiting for our ride to pick us [Madde, Micke and me] up after our whole day of shopping at the SM Mall of Asia, I've spent a little of my time walking along San Miguel by the Bay which is located right at the back of SM Mall of Asia. I've spotted people crowding around something I have no idea about. To feed my curiosity, I've joined the crowd and have blended in. Oh! 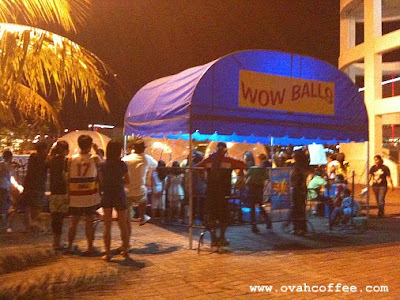 So, it's the Wow Balls the people are interested about. 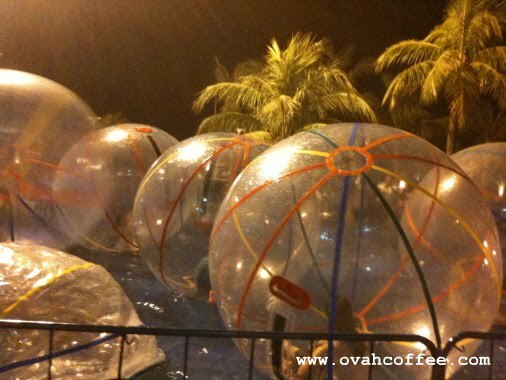 That night has been my first time to see these huge balls on water with humans in it [one person per ball policy]! Wow Balls make it possible for an individual to walk on water... with a price of course. It costs Php50 for 15 minutes which is reasonable, I guess. Although it looked interesting, the only thing I didn't like about what I saw was that the Wow Balls' inflatable pool was not large enough to give the Wow Ball payees more space to roll their balls. They just kept on bumping onto each other making it impossible to move around ---that seemed to lessen the fun. Was I able to try it? Unfortunately, NOPE. The line was long and my uncle had already arrived to bring us back to our apartment. I look forward to experiencing Wow Balls the next time I visit the Philippines!